Our menu is based on wholesome, local ingredients made simply so you can focus on the “job in hand” – enjoying the movie! You can have a meal before, during or after the film. If you wish to have a meal during the intermission please order before the session starts. We will prepare your meal as you are watching the movie and it will be ready for you when you come out. Intermission usually lasts about as long as it takes, occasionaly a little longer. If you do not have time to finish your meal just ask for a tray and take your meal back in to the theatre with you. 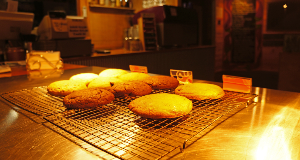 Our delicious treats, like fresh, hot cookies, our own home-made ice-cream and a selection of cakes and slices are served anytime at the counter. We have Gluten Free options available on request for most menu items. Our own home-made pizza base with a rich tomato sauce, mozarella cheese and your choice of topping.